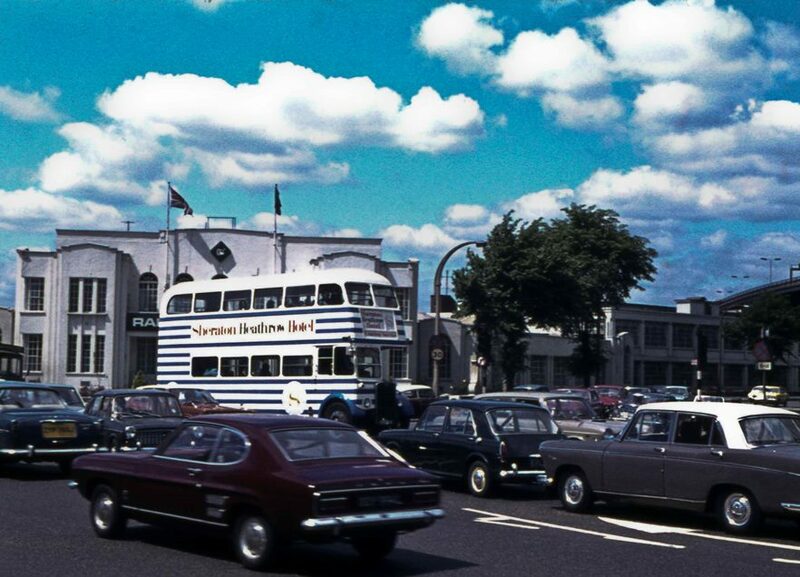 Peter Young took this photo of the Sheraton Heathrow Hotel Bus on the 2nd June 1973. With its distinctive blue and white strips it certainly stood out. The sky suggests California but the cars are in keeping with the Great West Road. In 1969 Rank Audio Visual moved into the complex of former factory buildings, centralising their marketing and service divisions which had previously been scattered across West London. The transformation of the works interiors into pioneering open-plan office layouts and studio space involved alterations on a scale which later counted against the listing of the surviving facade of the Maclean’s building (which dated from 1932). The factory was demolished early in 1997 after standing empty and in a state of increasing neglect following Rank Audio Visual’s withdrawal from the site in the mid-1980s.